On Friday February 17th, PORCELANOSA Grupo closed the 24th Global Architecture and Interior Design International Exhibition. The assessment carried out after a few days showed that in this 24th edition of the exhibition, attendance records had been broken again, with an increase of 15% in relation to the 12,000 visits in 2016. 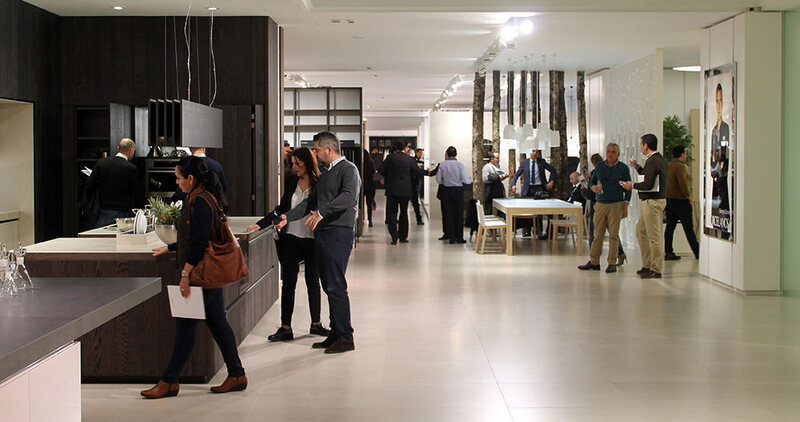 A real success for the PORCELANOSA Grupo, as from these attendance figures it is worth highlighting the large number of foreign visitors that came to the HQ in Vila-real throughout the week. Around 9,000 visitors coming from up to 80 different countries, mainly from Central Europe and the USA. All of them have been able to enjoy the 14,000 square metre exhibition area that the company has distributed among its eight firms, and in this way, they have been able to learn about new trends regarding architecture and interior design. It is also worth mentioning the great impact that the event has had on the local hotel industry, reaching 800 daily overnight stays and over one thousand lunches and dinners, both in the municipality of Vila-real, in Castellón and Valencia. During 2016, the Porcelanosa Grupo has been able to consolidate economic figures with a turnover of €845 million, 7% higher than last year. 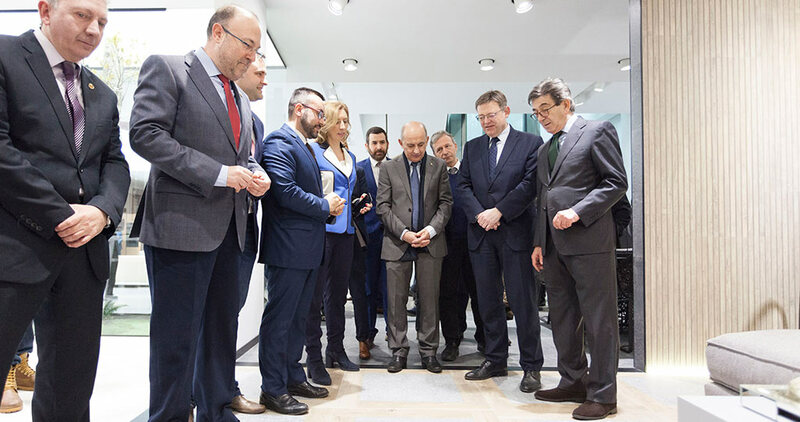 It was Mª José Soriano, the Managing Director of Porcelanosa who touched on those figures during the visit of distinguished personalities such as José Bono, a former minister, and Ximo Puig, the President of the Regional Government of Valencia, to the opening of the 24th International Exhibition. Soriano also announced an investment of 50 million euros, with 30 million euros being aimed at infrastructure improvements, such as the new coating plant; or the tunnel between the Venis production plant and the auxiliary workshops. Two significant developments which came as a lure to this latest edition of the PORCELANOSA Grupo International Exhibition. 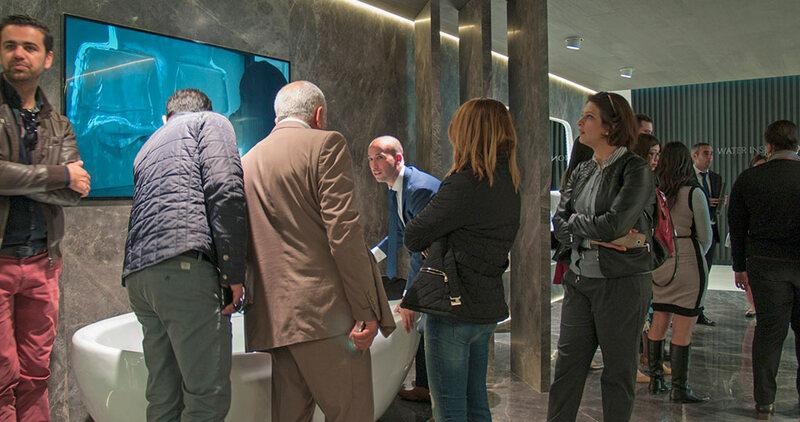 From February 13th to 17th, the eight firms from the PORCELANOSA Grupo let professionals and visitors in their renovated showrooms, with the aim of letting them get to see the latest additions in architecture and interior design. A fleet of 50 vehicles made both the transport and the links easier. 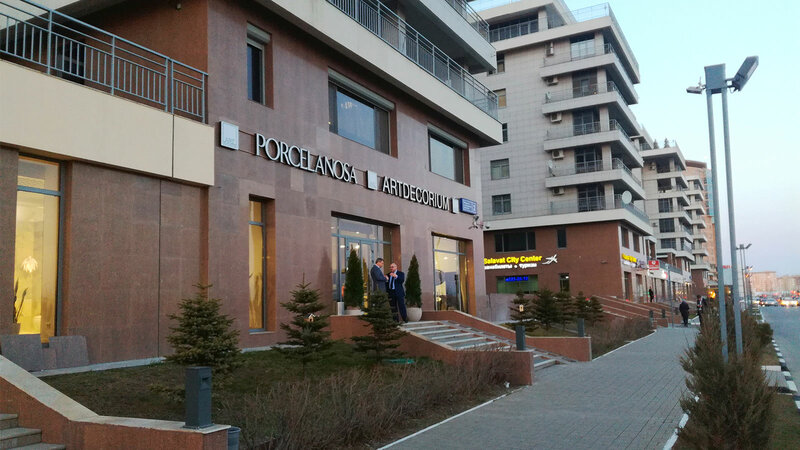 Porcelanosa impressed customers and clients, architects and interior designers through the material combination in flooring and ceramic wall tiles. The latest products which join different textures as well as updated formats into the same design: new shapes and sizes, which in a vintage finish, have succeeded in revolutionising architecture. Venis focused its showroom on new designs such as the Mirage collection. A ceramic design inspired by natural slate, and available in both flooring and wall tiles in endless colour tones. Taking natural wood as a source of inspiration, the PORCELANOSA Grupo also presented STARWOOD. A bathroom concept based on natural wood to create authentically craft flooring and wall tiles. Urbatek, for its part, has created a large-format extra-slim porcelain tile, which is applied to both façades and indoor wall tiles, flooring or furniture covering: XLight Premium. 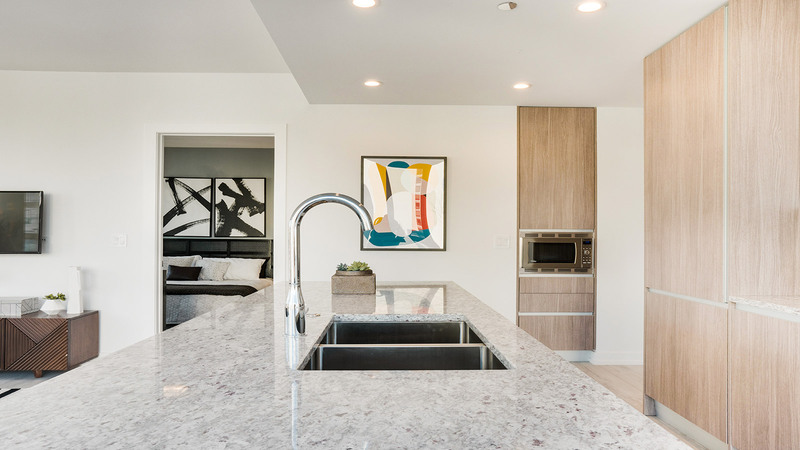 A highly-resistant and quality product, which inspired by marble, can provide projects with uniqueness and excellence. On the occasion of the 24th International Exhibition, L’Antic Colonial showcased designs for the integral architecture, highlighting new mosaics, wood, large-format slate wall tiles, and natural stone bathroom accessories, together with the Tono collection by Foster+Partners. Gamadecor, for its part, extended the choices regarding bathroom design, through innovative impact, elegant and very contemporary bathroom furniture designs; without forgetting about the Premium Emotion, Residence and Projects kitchens. Systempool has managed to revolutionize the uses of its state-of-the-art mineral compact, by providing it with a new characteristic which means a quality and innovation leap: K-Life. This project stands out because of the addition of a variety of triggers, which when coming into contact with light, they purify the air and carry out the disposal of chemical products. In its technological experiential showroom, Noken banked on the presentation of its renovated Arquitect collection, in high-range ceramic and with a big array of finishes. 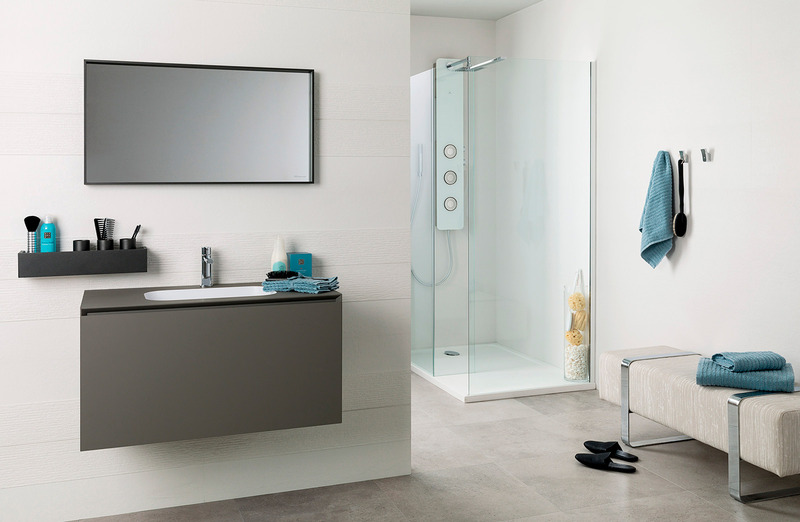 The firm also presented the Pure Line Glass furniture and the new shower trays, which are introduced in Noken to conceive an integral design item for the bathroom. Last, but not least, Butech focused on the new Micro-Stuk Design collection, a high-performance decorative wall tile without joints, which has resulted in being a real revolution for the audiences attending the exhibition. It is a design which is added, in its new finishes, to the high innovation in building systems that the firm is characterised by.